The copper beech or fagus sylvatica ‘Atropurpurea’ is a beech cultivar developed from the natural species, which is generally known as the common beech. Apart from one striking feature, there are hardly any significant differences between the common beech and the copper beech. The most important reason why people may prefer the copper beech over the common beech lies in the fact that the ‘Atropurpurea’ cultivar has reddish or deep purple foliage rather than green leaves, which makes the copper beech a very ornamental plant. The colourful leaves offer year-round interest, as the leaves are coppery red when they are young, gradually darkening to rich copper or even a dark shade of purple as the summer and autumn progress. When the winter arrives, the leaves of the copper beech will have acquired their ultimate colour. As the leaves remain on this hedge plant during the winter, their striking colours will truly stand out amidst the bare branches of neighbouring trees and shrubs. 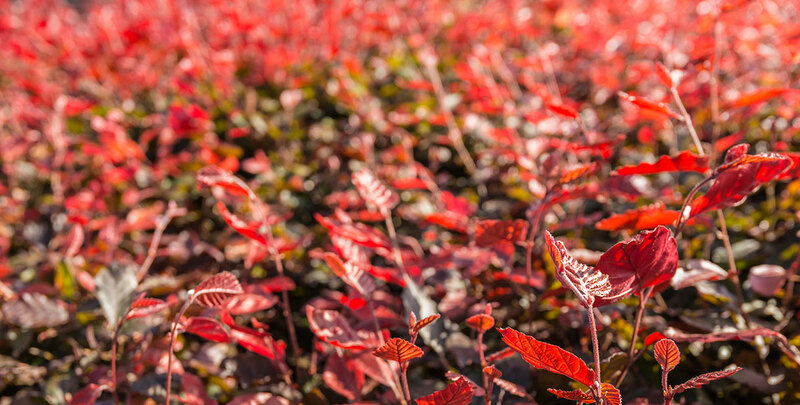 As an additional advantage, this quality allows a copper beech hedge to provide year-round screening and therefore guarantee the privacy of its owner, which is an uncommon quality for a deciduous hedging plant. Furthermore, the common beech is native to Europe and the UK and just like its natural parent, the ‘Atropurpurea’ cultivar will therefore have no problems coping with our climate. Before the young leaves of the copper beech unfold, they will have a very characteristic, cigar-like shape. Copper beech is a very versatile cultivar, tolerating a wide range of soil types. This includes a number of soils that are generally considered difficult, such as sand, lime and chalk. However, heavy clay and waterlogged soils should absolutely be avoided or, at the very least, treated. Copper beech prefers a fertile, humus-rich soil, so in order to get the most out of your copper beech saplings, it is highly recommended to add some suitable natural fertiliser or compost to the planting hole. Beech hedges generally have a preference for positions in the sun or partial shade, but they will tolerate a location in the shade. If you are considering planting a copper beech hedge in your garden, we strongly recommend planting bare root saplings any time between October and mid-winter. With no more than a minimum of care, your copper beech hedge will grow 30 to 60 centimetres per year, which is remarkably fast for a native hedging plant. It would almost seem as if the copper beech was specifically designed to make attractive, low-maintenance and formal hedges. Copper beech requires only one pruning session a year in order to retain its shape, but it can even be left to its own devices for a wilder, more natural look. This will not only require less work, it will also make your copper beech hedge more attractive to wildlife, as its branches will provide more shelter to small animals, such as birds. If you would like your copper beech hedge to be more formal in appearance, we recommend pruning it in August, though trimming it during the spring is also acceptable. When people are looking for a colourful garden hedge, they generally look for flowering hedging plants that will enhance the appearance of their gardens when their flowers and berries appear. While the copper beech does in deed flower in April and May, its flowers are rather inconspicuous. What truly makes the copper beech stand out is its foliage – the leaves of the copper beech create a beautiful display during all seasons. Even during the winter months, when all other deciduous hedging plants have little more to show than bare branches, the dead leaves will remain on your copper beech hedge, ensuring privacy and year-round screening. This way, the copper beech truly combines the seasonal colours of a deciduous hedge with the privacy qualities of an evergreen. If you would like to try something different, you could even create a native mixed hedge with fagus sylvatica ‘Atropurpurea’ and a number of green fagus sylvatica for a lovely effect. Since both varieties have similar soil and maintenance requirements, as well as an identical growth habit, this combination will result in a perfectly balanced hedge which will look amazing throughout the year.